Get a dinner jacket that reflects your style the right way with this shiny rust metallic dinner jacket by Blu Martini. These entertainer style blazers have the head turning style that is made to get you noticed like nothing else. 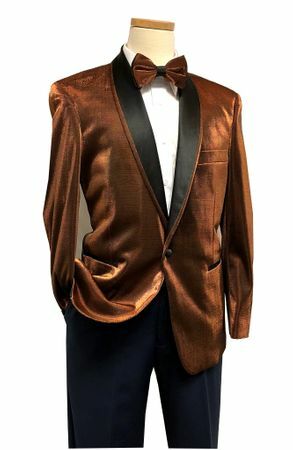 This rust color dinner jacket is made of a metallic fabric that is made to shine with black satin lapels and side vents in a modern fit with the matching bow tie.